Last semester, Dunwoody Architecture students in the Studio 4 class partnered with Como Zoo to conceptualize a future red panda exhibit for the park. 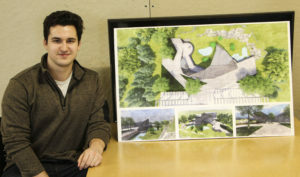 While working at the zoo last summer, Architectural Drafting & Design Instructor Kerrik Wessel learned about the zoo’s ongoing construction projects and vision for expansion, which included an idea to renovate the concrete pond into a red panda exhibit. He connected students with Laura Wake Wiesner, head of visitor services at Como. “I wanted students to consider how it would be for an animal to live in this enclosure they built. I also wanted them to have their piece designed with a story and connection to animals in mind,” Wiesner said, highlighting the importance of conceptual design. Despite hearing the same project pitch, students took their projects in very different directions. 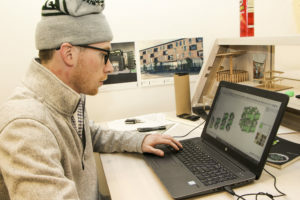 Third-year student Austin Rastall, for example, drew inspiration from a trip to Mexico. Student Austin Rastall with his one of his final boards for the Como Park project. “We went zip-lining, and as I rode down I noticed the light coming through the trees. They made a lot of different patterns and led you from a space of dark to light,” he said. In his stainless-steel design, Rastall made it so the zoo guests are guided by light to the animal enclosure. Third-year student Tanner Konen thought back to memories of seeing tigers’ pace at the zoo. He wanted something that was natural and functional. “I went with bamboo for my enclosure. Bamboo made sense to use given the environment red pandas live in,” Konen said. Through use of these materials, Konen was able to incorporate elements of modular design into his project as well. While exploring the use of different building materials, students also experimented with 3D rendering and modeling. Konen, who currently works as a 3D designer, found the experience extremely useful in his professional life. Through working conceptually in a hands-on environment, students like Rastall and Konen are groomed to become high-end professionals. “Students get marketable skills by their second year and get jobs,” Wessel said. Through the Como Park project students expanded their portfolio. Wiesner stated that she was very impressed by the students work. Currently, Como is working on their Como Harbor project. 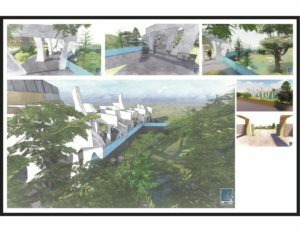 Following its completion, Como hopes to possibly use these student concepts as inspiration and future fund-raising tools to help expand the zoo’s current infrastructure. However, no current plans are in place at this time.